Turfgrass in compacted soil (left) grows slowly, lacks vigor and becomes thin or does not grow at all. Core aeration (center) removes small cores of soil, depositing them on the surface of the turf. This improves the depth and extent of turfgrass rooting (right), and it can help save money on your water bill. Core aeration is a form of soil cultivation through the process of removing plugs of soil and thatch from the turf by passing a drum with hollow tines over the surface. 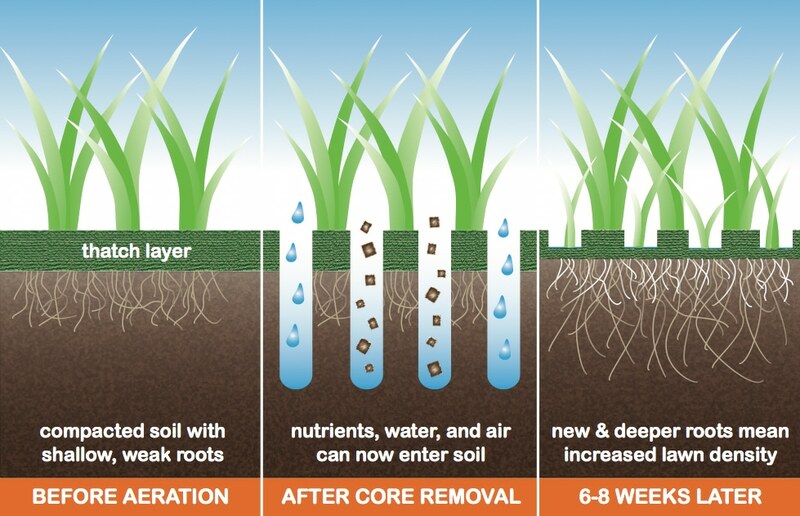 Core aeration reduces soil compaction, promoting a greater exchange of air between the soil and the environment. The breakup of soil compaction creates small channels which allow water, oxygen, and nutrients to reach the turf roots. Lawn care professionals unanimously agree that seasonal lawn aeration provides the greatest benefit for your turf. Aeration in the spring will increase water absorption and encourage a thick lawn throughout the growing season. Fall aeration will help to break up the soil compaction which will naturally occur due to regular watering and the constant hardening from sunlight. Cool climate grasses like Kentucky Blue-grass and Rye-grass enjoy spring aeration to break up thatch that accumulates through the winter, while fall aeration enhances root growth which will promote a quick spring greening. Aerate regularly to maximize the efficiency of each core cultivation service. Packed clay soils which are so common in Colorado will require a professional aeration to combat restrictive soil compaction. Heavily trafficked and south facing lawns are also heavily affected by soil compaction. The benefits of turf aeration are maximized by close tine spacing and deep plug depth. It is important to develop deep water penetration while being cautious not to turn the yard into a bog. Over-saturation of the lawn will not withstand the weight of the cultivation equipment, leading to likely turf damage. Lawn Care Plus recommends heavy watering in the days leading up to the aeration service and restricted watering the day of service. Following your core aeration, you will notice many small plugs of soil across your lawn. These plugs are intentionally left behind and will return necessary microbes when they disappear into the soil. The aerification cavities will now allow water and nutrients to penetrate much deeper into the soil. Your lawn can now sustain longer periods without water. If you previously experienced pooling or poor drainage, you will see an immediate correction of this issue. Regular aeration will strengthen your lawn to withstand heat and drought stress. Within two weeks you will notice white roots spreading into the aerification cavities. This is a sure sign your lawn growth is promoted by core aeration. Like most services, the performance quality determines the final result. In core aeration, the standard of excellence is directly connected to the type of machine used. 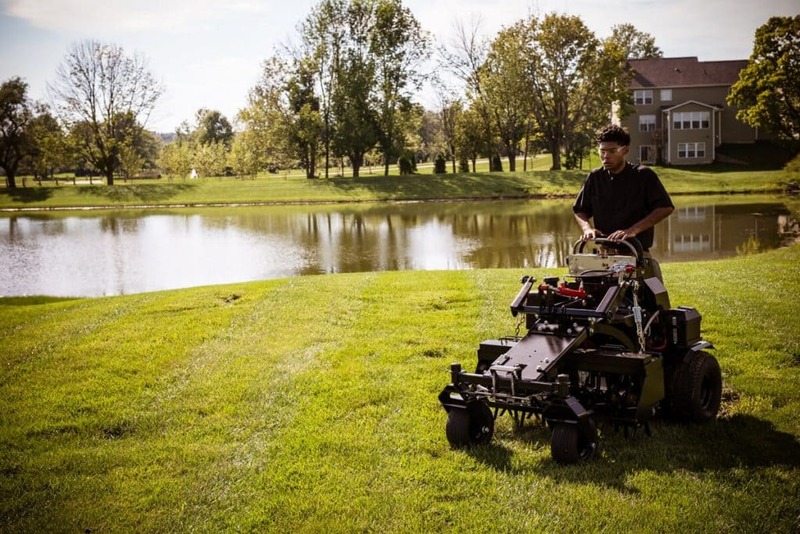 Some providers use open-tine aerators which punches the soil, unlike the hollow-tine aerator used by Lawn Care Plus which pulls soil cores directly from the earth. The intention of core aeration is to remove the plugs and reduce soil compaction, and Lawn Care Plus walk-behind machines reach core depths up to 2-3/4″ and feature thirty tines spread over a 19″ swath. Our stand-on machines reach core depths up to 3 1/2″ with sixty tines over a 40″ swath and an industry-leading retrieval rate of 5 plugs per ft2. Lawn Care Plus understands the importance of quality work, so we only use quality equipment!